The F5 BigIP can be setup as a native Kubernetes Ingress Controller to integrate exposed services with the flexibility and agility of the F5 platform. This allows for the security integration as well depending on licensing, such as the ASM - Application Security Module otherwise known as a WAF - Web Application Firewall. Using the F5 controller allows integration into on-premises and cloud environments. Though realistically, this will probably be used for on-premises deployments 95% of the time, either on bare metal or virtualized workloads. The F5 Container Connector or ingress controller has two methods of operation. In this method of operation from a logical perspective, this is what the F5 BigIP looks like in the network. The BigIP sits outside the cluster network and and has no visibility into individual pods. This has some dissadvantages. This is because the Kubernetes Service must be configured as NodePort and the F5 will send traffic to the Node and it's exposed port. Then the kube proxy will do the internal load-balancing. Latency is added to the mix by sending traffic to the node, then having the kube-proxy distribute the traffic. If you want to to configure as NodePort Mode or have limitations that you have no other choice. Follow these instructions on the F5 official documentation, we’re going to concentrate on Cluster Mode in this post. In cluster mode, the BigIP becomes part of of the Kubernetes Cluster Network. Meaning, there’s direct access to Pod networking as such. This is the recommended integration as it has advantages and predictability. In cluster mode, there are two ways of integration. 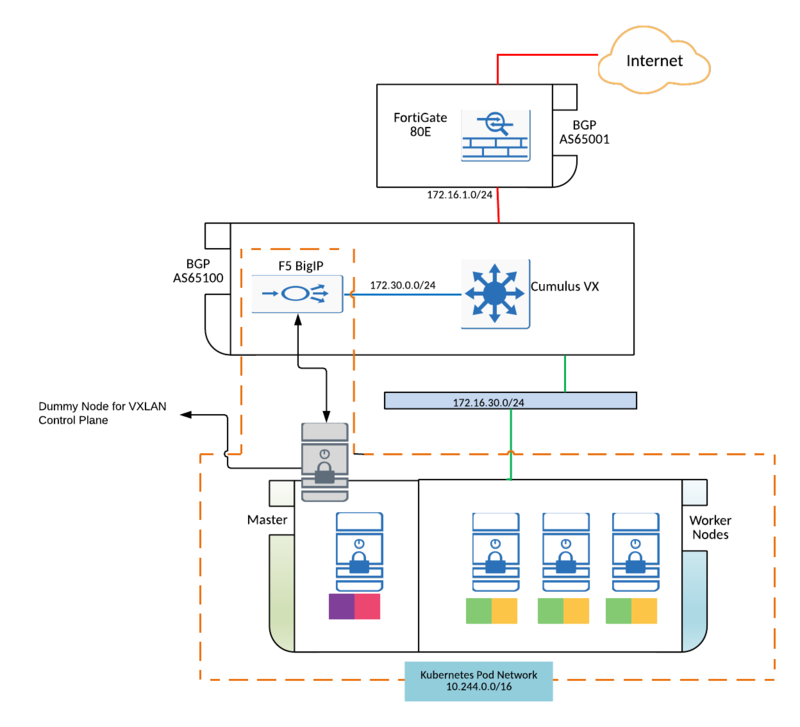 For this guide I’ll be using Flannel for networking and utilizing VXLAN integration. The important piece here is using Flannel for networking and not so much Calico, I just use that for network policy as I like the integration. This implementation is known as Canal. The default --pod-cidr-network for Kubernetes using flannel is 10.244.0.0/16, this hasn’t been modified for this deployment. Though you can manually download the yaml file and update it, I’ve confirmed it works in previous testing. I left it untouched for this to simplify the explanation and if you read the docs and there are references to the default CIDR, just avoids confusion. The below instructions for getting the network setup assume a clean or brand new cluster. The CNI should be installed and enabled prior to adding any worker nodes. This will load Calico on your cluster only for it’s network policy integration. The default state of Flannel is VXLAN mode, no need to touch the yaml unless you require customization such as the Pod CIDR network. Once you apply the commands you can verify all is working correctly. The master should be in Ready state within a few moments. Verify flannel and if loaded the calico pods are working as well. •100% [I] ➜ kubectl get -n kube-system pods | egrep --color "canal|flannel"
You may want to verify CoreDNS pods are also running. Once these steps are completed, follow the installation procedure you’re using to setup the nodes. If using minikube, I’m not sure this will work as this environment is setup in an ESXi 6.5 cluster running one master and three worker nodes. The next few sections (steps) can really be performed in any order, as when learning kicks in eventually services will discover each other. However, I found this order to provide the most predictable of outcomes. Also I felt like writting it in this order, so deal with it 😜. Lets get to it, shall we. Looking at the output above, we’ve accomplished three things, two of them being actions. Create a self IP using an address from the subnet you want to assign to the BIG-IP device. create a floating IP address in the flannel subnet you assigned to the BIG-IP device. For the VXLAN participation POD subnet, I picked the last /24 available in the 10.244.0.0/16 as Kubernetes tends to assign node subnets in order. Next we need to deploy a dummy node into our Kubernetes cluster, not sure why, even the F5 docs are vague. This is the only way the BigIP can become part of the cluster and insert itself into the VXLAN overlay. This dummy node will always have a state of NotReady which is normal. It takes about 3 minutes counted non-sciency way. To deploy apply this command. If you’re the curious type, this is what the yaml looks like. # Define the flannel subnet you want to assign to the BIG-IP device. # Be sure this subnet does not collide with any other Nodes' subnets. The VtepMAC is found by running the below command in the appropriate partition, the one you created the tunnel above. The other assigns the node as subnet manager for given CIDR range. The next annotation flannel.alpha.coreos.com/public-ip is the ip address of the VTEP endpoint we assigned to the F5 BigIP system. The podCIDR spec option uses the same flannel_vxlan tunnel we assigned above. In this case, we give it a /24 instead of the full /16. The first statements gives is a routing table entry, meaning we need to know where the entire range exists. The podCIDR spec says which part of that CIDR range we own. The documentation states that all ingress “service” addresses must be part of that podCIDR range. Though I have found that external IPs also work. For example, in our diagram, the 172.30.0.0/24 range is what I use for F5 virtual-servers, and using a service address in that range works just fine. The next two commands leave as is, one specifies the backend type, in this case we want VXLAN. Once the apply the yaml file with the kubectl command, we’ll see the node show up in our node table. Once the node is running, from a logical perspective the environment looks as below. One thing to note, at least on my setup is that dynamic learning of FDB table for the F5 device does not work. I have a feeling this is due to limitations in the VMware networking stack. If you were to try and show the forwarding table for the tunnel endpoints at this stage, you’ll get something blank as below. This will prevent the F5 BigIP from forwarding traffic and you’ll spend more time than you need troubleshooting this. Don’t be like me, just enter the static routes below if you’re working on your own VMware environment. To fix this simply add static entries for node endpoints (with more time I’ll test on baremetal) on the BigIP device and the correct partition, for me this is k8s-controller. To find the mac-addresses for the VTEP on the node perspective, simply run any of the three commands below. Here’s an example on two different nodes running the bridge fdb show command, it’s more efficient. Then run ip -4 addr show to find the local mac-address of the VTEP. In the link/ether line you’ll find VTEP mac for this node, also below the ip address associated with the node. This is necessary as the first command only shows dynamically learned addresses. Now we’re ready to deploy the ingress controller (finally right! !, I know). There are four things we need to do. The contents are very straight forward. If you’re curious as to what the username and password actually are, just run. I don’t really care if you know, it’s lab password and has already been changed, but please don’t do this in production, create real passwords and don’t put them up on public github repos. Okay? Don’t be that guy or gal. The next few steps we’re going to apply blindly, if you want to know, checkout my repository on github or the official docs. So I lied a bit, we’ll need to dissect the deployment yaml a bit, I know, I know, too bad. In the yaml we make reference to our secret for our arguments to the container configuration. Make sure if you change the secret name, it matches in the reference. If you’re changin names, I’m assuming you understand how this works, this is not a primer on kubernetes. Also make sure the --bigip-partition matches the one you created and the --bigip-url matches your configuration. Wow, that was allot of work to get a simple ingress controller working! I have three word for you, automate the things. Lets deploy our application, because this has been long and you’re probably tired (not me though), I’m just going to use an off-the shelf ghost container. No, not this 👻 type of ghost, the blogging platform. Keep in mind, this is not production ready, it is not using any type of database for persistence. There are plenty articles on making this production ready, LMGTFY. There are a couple variables you may want to change, as your environment probably looks nothing like mine. All these are within the Ingress declaration, the rest can stay the same as it’s just for testing. - host: your-domain.here.com # CHANGE ME!!! Normally these only have one container in the pod, the reason you see in READY 2/2 is because I have istio installed and injection is enabled. Don’t worry about it too much, that’s another post or 20 in itself. That’s it, the rest can be left alone and you can apply the yaml. Open a web browser and visit the page you setup or use curl to test. If you get a status code of 200 you know it’s working. The ghost containers take a little while to become ready, so give it about 2 non-sciency minutes. You can also verify the virtual servers, pools and nodes were created in the BigIP. This can be done via the GUI (not me) or the CLI, I’ll show the CLI it’s just quicker for this. This is much in the same, make sure the number of nodes match the number of pods in the deployment. There’s no state checking for the node itself, which is the same reason availability shows as unknown. This is where the health check happens, and as you see Availability displays the correct state of available. If anything else would show, as unavailable make sure that the health check parameters in the Ingress declaration above matches your setup. For those that like the GUI, here are some pretty pictures of the above information. What were you expecting more? This wasn’t long enough for ya? Come back for some more topics. I’m trying to put up a post once a week, though sometimes that becomes hard, I’m trying though as it’s my own way of sinking topics into my small(ish) brain.